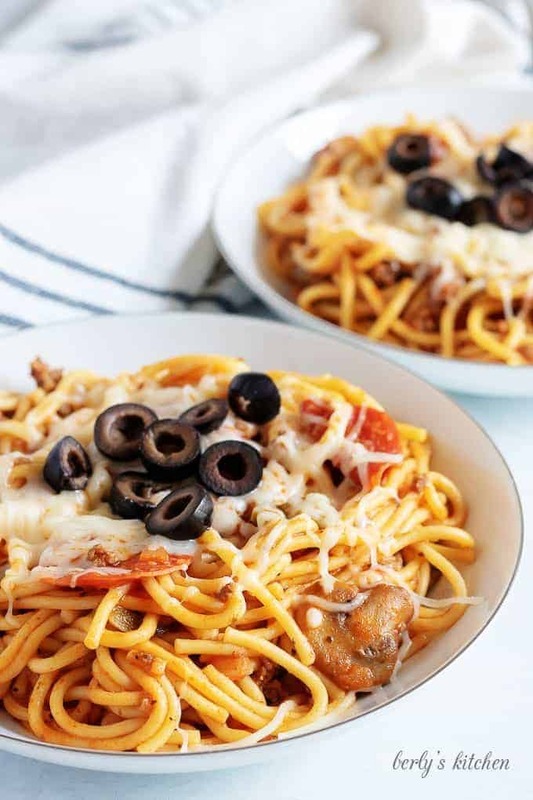 Instant Pot Supreme Pizza Pasta – It’s the best of both worlds if you are in the mood for pizza and pasta. 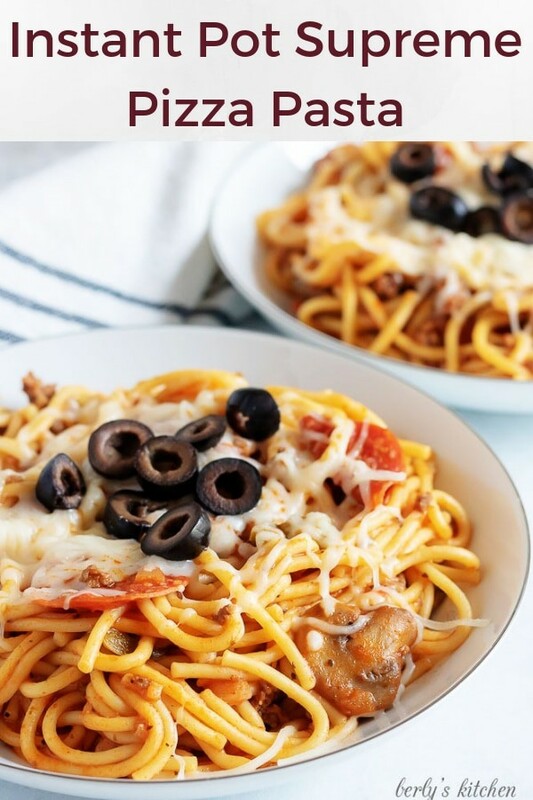 This ultimate food mash-up combines all the ingredients of a supreme pizza with the ease of Instant Pot spaghetti. We eat more than our fair share of pizza and pasta. Some of our favorites include lemon basil pasta, chicken fajita pasta, and chicken bacon ranch pizza. Like a lot of busy families, we have those nights that we can’t decide what to eat. Instant Pot spaghetti is one of our go-to meals. That recipe isn’t on the blog yet, but is coming soon! This time we decided to change things up since some of us wanted supreme pizza made with our homemade pizza dough and others wanted pasta. Start by turning the pressure cooker on to saute, and add the meat to the inner liner. We used 93/7 ground beef, but ground pork or Italian sausage would also work. Toss in the diced onion, garlic powder, onion powder, Italian Seasoning, and salt. *Don’t forget to adjust the seasonings as needed. If you use a sausage that is salty, you may not need as much salt. Cook the meat and onion mixture until the meat is cooked completely and broken into small pieces. Next, add the green bell pepper and mushrooms. Give the mixture a good stir, and cook another 2-3 minutes. I didn’t drain the meat prior to adding the pepper and mushrooms, but that’s an option if there is a lot of grease. The 93/7 beef didn’t have a lot of excess fat, so there was no need to drain it. Layer the pepperonis on top of the meat mixture. If using spaghetti noodles, or another long noodle, break the noodles in half and lay them crisscross on top of the pepperonis. It’s going to look like a LOT of noodles, and it is. Trust me, though, you’ll want to fan those out as much as you can to keep them from clumping. Next, pour the jar of pasta sauce on top of the noodles. It doesn’t look like it, but I did try to spread the sauce around evenly. This isn’t one of those recipes where you stir everything together before it’s cooked. I wanted all those noodles covered as much as possible. Don’t throw away the sauce jar yet. You’ll need it again in a minute. Next, layer on the diced tomatoes and their juices. Grab the pasta jar and fill it with water. I wanted to be sure the water got to the very bottom of the liner where the meat mixture was sitting, so I poured it down the side. After that, fill the jar halfway with water and pour it that into the pot. That should be a total of 1 1/2 jars of water. At this point, the pot will look very, very full. Mine was right at the “Max Fill Line.” I’m not gonna lie. I was worried. I grabbed a wooden spoon and pushed all that supreme pizza pasta goodness down into the liquid as far as it would go. It wasn’t far, but I did want to get the noodles under the water. Close the lid, and set the pot to manual/pressure cook for 7 minutes. Honestly, 6 minutes would probably have done it, but I went for 7 because we live at a higher elevation, and it takes a tad bit longer to cook a lot of things. Due to the volume in the pot, it did take about 15 minutes or so for it to come to pressure. After the time is up, do a quick release and be very careful removing the lid. The contents expanded some, and it was boiling. There is quite a bit of liquid that comes to the top, but give the pasta a good stir to mix all the ingredients and the liquid will incorporate. Any residual liquid will absorb as the pizza pasta cools. 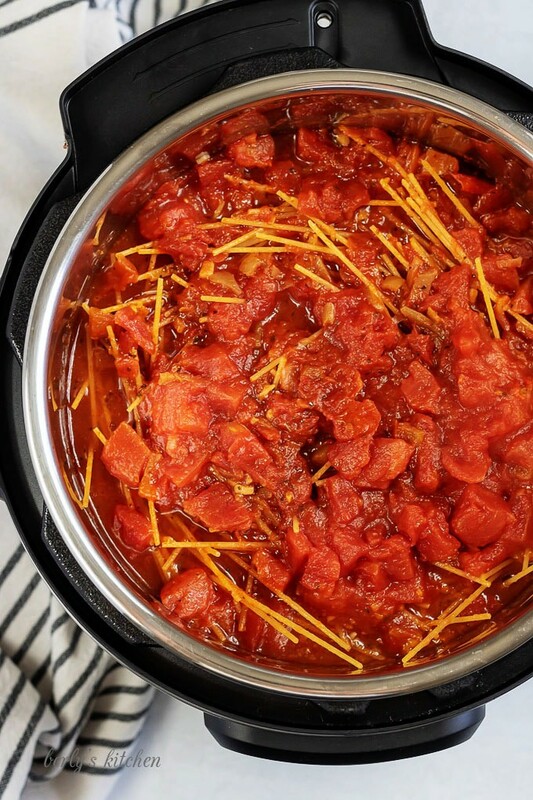 Serve this Instant Pot spaghetti hot with your favorite cheese and other pizza toppings and sides. We made this pasta in a 6-quart Instant Pot Duo, and it worked great. However, as mentioned above, it was very full. Right up to the max fill line. If you have an 8-quart pressure cooker, I’d recommend making this spaghetti in it instead of the 6-quart. Make sure to crisscross the spaghetti noodles to minimize clumping. If clumping occurs, use a fork to pull the noodles apart after they’re cooked. Use your favorite ingredients. 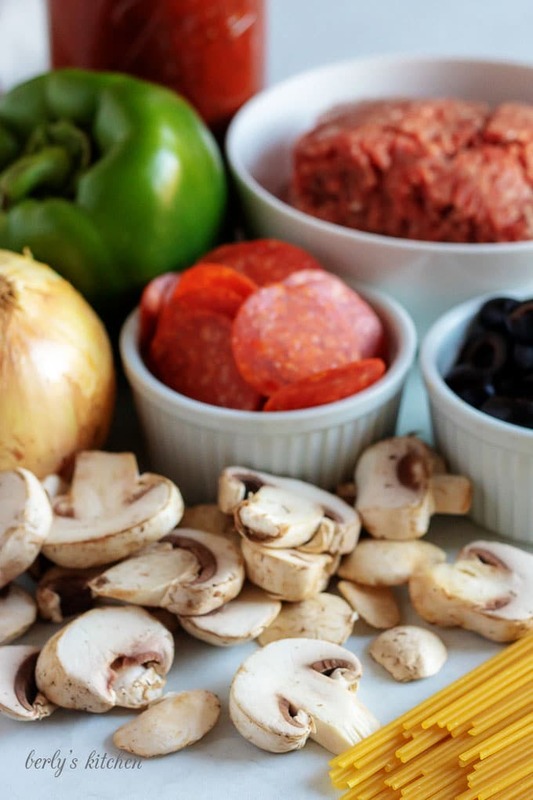 Some common supreme pizza ingredients are ground beef, Italian sausage, pork sausage, ham, Canadian bacon, pepperoni, bacon, green bell peppers, red onions, white onions, mushrooms, black olives, mozzarella cheese, and Parmesan cheese. 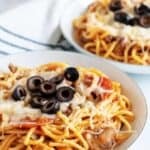 Instant Pot Supreme Pizza Pasta - It's the best of both worlds if you are in the mood for pizza and pasta. This ultimate food mash-up combines all the ingredients of a supreme pizza with the ease of Instant Pot spaghetti. Turn the pressure cooker to saute and wait for it to get hot. Add the ground beef, onions, onion powder, garlic powder, Italian Seasoning, and salt. Break up the meat into small pieces, and cook until the beef is browned completely. 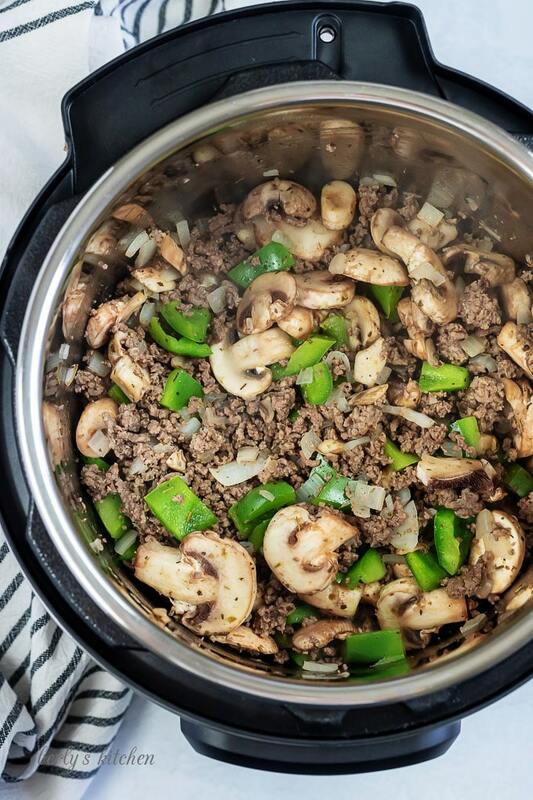 Add the bell pepper and mushrooms and stir to combine. Cook another 2-3 minutes. Layer the pepperonis on top of the meat mixture. Next, break the spaghetti noodles in half, and place them in a crisscross pattern over the pepperonis. The more the noodles are fanned out, the less likely they are to clump. Pour the pasta sauce over the noodles and try to disperse it evenly. Add the diced tomatoes with juices to the very top. Finally, add the water, making sure that it sinks all the way to the very bottom of the pot. Ideally, it should sink below the meat mixture. This helps to avoid a burn notice. Use a wooden spoon to press the noodles down into the liquid. Close the lid and ensure the valve is closed (set to sealing). Use the manual/pressure cook button and adjust time to 7 minutes. After the time is up, complete a quick release, and very carefully remove the lid. The liquid may still be bubbling and have more volume, so it's important to move slowly and be cautious to avoid accidents. 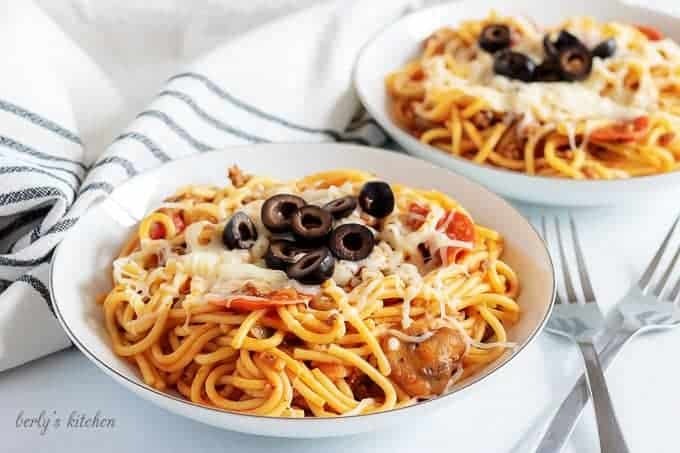 Stir the pasta to incorporate the liquid, and top with cheese and olives. 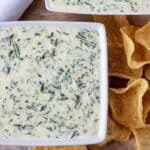 The cheese and olives can be added to the entire pot, and mixed in or added to each individual dish. 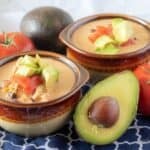 Serve hot, and store any leftovers in the refrigerator for up to 3 days. *The calories listed are an approximate and are based on the ingredients and amounts used. *The excess liquid in the pasta will absorb as the dish begins to cool.